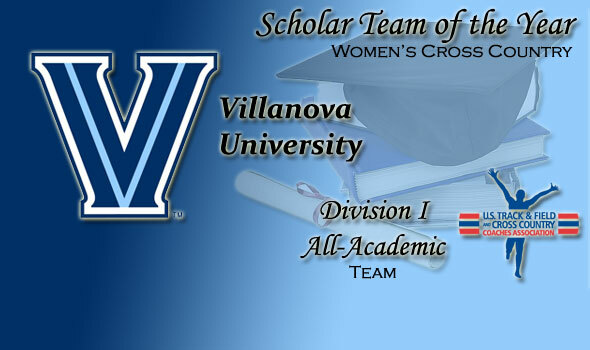 NEW ORLEANS – Villanova University’s women’s cross country team is the 2009 NCAA Division I USTFCCCA Women’s Cross Country Scholar Team of the Year, the U.S. Track & Field and Cross Country Coaches Association (USTFCCCA) announced on Friday. The Scholar Team of the Year distinction goes to the program that earned All-Academic Team honors and placed the highest among the field at the NCAA Cross Country Championships. Villanova won their eighth NCAA Women’s Cross Country title in November, defeating runner-up Florida State 86-133. Head Coach Gina Procaccio’s Wildcats also claimed the NCAA Mid-Atlantic Region title and Big East crown in 2009. In addition, the squad members carried a 3.38 cumulative grade point average after the fall 2009 semester. Alabama leads All-Academic Team honorees with a cumulative team GPA of 3.86. Missouri State is next on the list at a 3.81 GPA. A record total of 176 Division I women’s programs received USTFCCCA All-Academic Team honors, up from 2008’s total of 162. Nine of the top 10 and 18 of the top 20 teams at the NCAA Cross Country Championships earned the honor. In addition, regional champions from all nine NCAA regions claimed All-Academic honors. The Big East led all conferences with 13 squads mentioned as All-Academic recipients. The SEC and Big Ten each scored 10 teams on the honor roll. For a team to be considered for the USTFCCCA All-Academic Team award, they must have competed and compiled a team score at an NCAA Regional Championship and also have a minimum 3.00 team cumulative GPA.